The Sony Xperia Play is an Android based smartphone running 2.3 (Gingerbread) on a 1Ghz Snapdragon processor with a Adreno 205 GPU on the Verizon Wireless network. These specs may sound like technical jargon, but it’s the slide out where the Xperia Play really differs from other phones. Instead of a keyboard hidden within, a Playstation-like controller is secreted within instead. Screen The 4″ touch capacitive screen is smooth to the touch and very responsive. It supports up to 16 million colors and has a 80×854 FWVGA resolution. The screen is crisp and easy to read and can support 3D games that have the graphical quality of the original Playstation. Playing original PSX games, like Crash Bandicoot, look exactly like the original games, and some games look even better. Battery Life I never used the Sony Xperia Play as my primary phone, but after playing games for long periods of time, surfing the web, reading twitter and all the other paces I put the phone through, it still had plenty of battery. Under heavy use, I was able to go a day or two without charging. Under light use, I went days without charging. They claim 405 hours of Standby time, and I am apt to believe it. Camera The Xperia Play has two cameras, as most smartphones do these days. On the back of the phone is a 5 megapixel camera with an LED flash and the front has a VGA camera. The back camera takes good quality pictures and the front camera is more for video conferencing with services like Skype than for actual pictures. I would like a hardware button to go to the camera, since it could be a pain to turn on the phone and go to the camera app to launch it. Media Player The Sony Xperia Play uses the Android media player, so it is able to play accepted audio and video formats without a problem. In addition to any media stored on the phone, it is able to stream YouTube, Pandora, HBO Go and an assortment of streaming media apps giving the user access to a large library of media. Keyboard and Controller The virtual keyboard has large enough keys on the 4″ screen to type one handed in portrait and two handed in landscape modes. When sliding open, a games menu opens up and a miniaturized version of the Playstation controller is available to use. The controller is similar to the PSP Go and the smaller buttons still feel comfortable and are easy to hit, including the L and R shoulder buttons, which are hidden behind the screen when it is opened up. The advantage of having a controller over on-screen controls really shown through while playing the games, and the tactile feel of a controller meant not having to look where a user is touching to interact with the game and not having thumbs covering any of the game area. Phone The sound on the phone sounds clear and full. The only time I had problems using it was when I was in a crowded store, but in that environment, I doubt I could have heard any phone. Hardware The Sony Xperia Play was comfortable to hold and curved well in my hand when using it as a phone or using apps. When playing games on the phone, my hands never felt cramped on the controller and was able to play comfortably for long periods of time racing the streets of Asphalt 6 or shooting terrorists in Splinter Cell. I really liked the Sony Xperia Play, which really met the intersection of a phone and a portable gaming device. 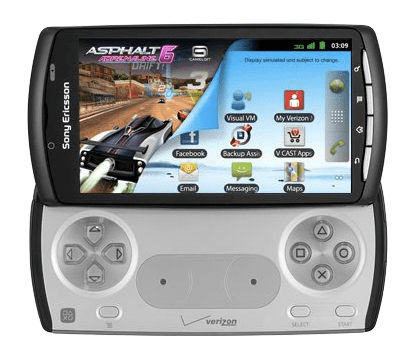 If I were as big a gamer as I used to be, this would definitely be the smartphone that would replace my Droid. My one complaint is the lack of original Playstation games available for the phone. If Final Fantasy 7, Wipeout XL or Metal Gear Solid were available for the Sony Xperia Play, I don’t think I would have put it down.